The United States is becoming a tribal culture. The Big Sort is rapidly underway, where were are all desperately moving to be around only those who think like we do. My friends, the children of my friends, and even my own children are all moving around the United States and abroad, searching for that perfect place. I have three very close friends whose daughters have moved, in decisions independent of each other, to Portland, Oregon. My brother, my nephew, and my good friend’s daughter all live in Brooklyn. Of course, some of those in Chapel Hill are moving to Durham. Only the real freaks, the real intellectuals, the real artists, live in Durham. But I do not know anyone who would move, or wish his child or his mother to move to Cary. Cary is not inexpensive or downmarket. Cary considers itself a very upper class place, but aggressively new and suburban. I know no one who would consider living there, or even go there without a good reason. We are all such snobs. It is really not that unpleasant a place. Sure, it is a disjointed collection of real estate developments. Walking is difficult, biking even more so. But if you ride around carefully on a bicycle, hidden in the vast collection of strip malls is a plethora of interesting places, especially ethnic eateries. Cary is much more multicultural than Chapel Hill, and not just because of the thousands of immigrants from India and Asia who live there. Even if you consider that there are relatively few African-Americans, just the white anglo population I observed there seems more wholly rounded that the trustifarian types you see in Chapel Hill and Carrboro. I had read someplace about Fortnight Brewing in Cary NC. Knowing nothing about it, I had put it on my list of places to bicycle to, as its twenty six miles each way from my home in Chapel Hill seemed to make a good full day ride. I set out by bicycle on a beautiful Saturday morning. When I got to the Cary city limits, only then did I realize that about a third of my journey each way was just crossing Cary. The housing developments with creative names just go on and on. 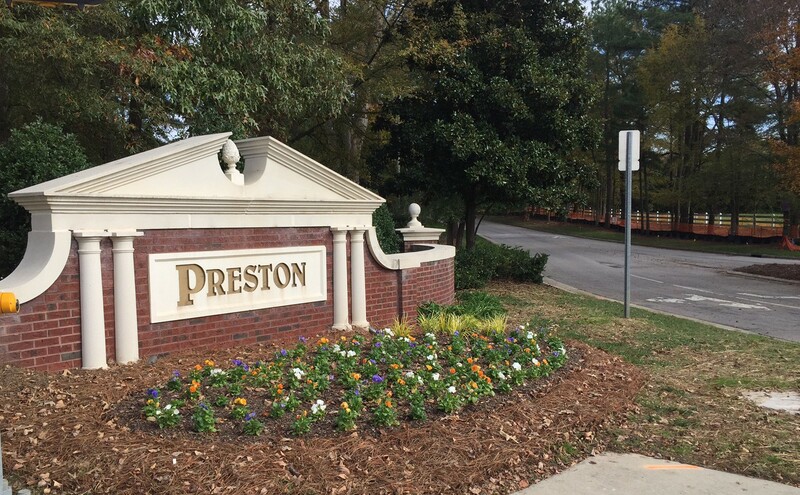 In central west Cary, one runs into repeated housing developments using the waspy brand name Preston. If you check Google Maps, it becomes even more apparent: Preston Village, Preston Plantation, Peninsula at Preston, Prestonwood Country Club, Preston Grande, Preston Falls North, Preston Falls Villas, Preston Meadows, Preston Greens, Preston Pines, Preston Forest, Preston Glen, Preston Ponds, Preston Arbors, Preston Lakestone, Courtyards of Preston, Preston Wynds, Preston Highlands, and Legends at Preston. I passed the gate to what must be the the original, glorious Preston. About 1:00 PM, I arrived exhausted and famished at Fortnight Brewing. Only on arriving did I learn that it is just a brewery and a bar, with no real food. Still, it did have an impressive porter, hand pumped in the English style by a young woman with a genuine English accent. Draining the porter, I headed down the road towards a barbecue place called Brew n Que, in a strip mall on Maynard Road. 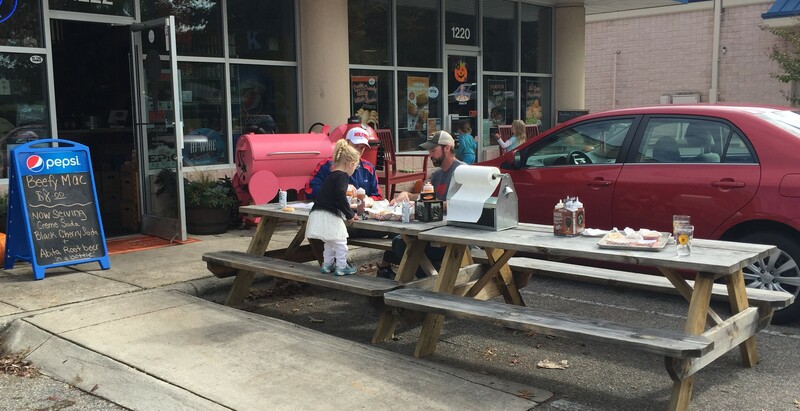 While I ate my barbecue sandwich, I watched two dads drinking beer while their three little girls ran around the parking lot. Satiated, finally, I turned the bike around and headed back to Chapel Hill. On the way back, on the far western side of the Cary diaspora, just before getting on the American Tobacco Trail bike path, I rode through something called Carolina Preserve at Amberly. There are houses stretching as far as the eye can see, in an area that was cow pastures not five or ten years ago. I was not familiar with Carolina Preserve, but also, what is Amberly? Carolina Preserve has an impressive logo.